The taxonomy of 'Golden Oriole' azalea bushes is Rhododendron 'Golden Oriole.' The cultivar name of 'Golden Oriole' suggests the color of these plants (see below). These are part of the Exbury group of hybrids, another example of which is 'Gibraltar,' which flowers a little later. Golden Oriole azaleas are deciduous flowering shrubs. Gardeners in northern New England do not have golden oriole birds in their region. Instead, they have Baltimore orioles, which are renowned for their bright orange color. The 'Golden Oriole' cultivar offers something of a compromise between those two bird colors. These azalea bushes display bunches (technically called "trusses") of golden-yellow flowers. But those flowers are preceded by orange buds. Plants start to bloom in April in all but the coldest areas, just early enough to be classified as one of the shrubs that bloom in the first half of spring. Like other Exbury hybrids, Golden Oriole's habit is mainly upright, reaching 6 feet in height with a spread of 4-6 feet. Although it does offer some reddish-orange fall foliage, much better selections if you are looking primarily for an azalea bush with nice fall color are the 'Johanna' and 'Stewartstonian' azaleas. These kinds bear red flowers and red fall foliage. Golden Oriole is best-suited to planting zones 5-8. Grow Golden Oriole in sun to partial sun and in well-drained soil. Amend the soil with compost. Azalea bushes require a soil pH that is acidic. Some treat Golden Oriole as a specimen plant. But these azalea bushes could also be used in foundation plantings and in loose hedges ("loose" meaning that this is not the type of shrub you would want to try to trim so as to conform to a tight shape, as you would with boxwoods, for example). Has your garden ever been eaten by deer? Then upon hearing that such and such a shrub "attracts wildlife," you may well regard that fact as a double-edged sword. Fortunately, being somewhat poisonous plants, azalea bushes are not a preferred food for deer. Of course, that is not to say that a hungry deer will not eat azaleas (they will eat almost anything when pushed to the breaking point). 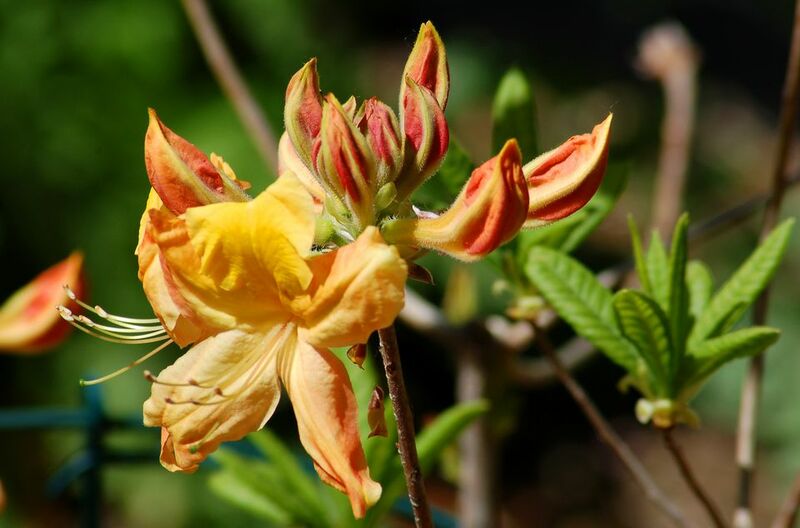 Most experts do not classify azalea bushes as deer-resistant, but neither are they the worst plants you could grow in a deer-infested area (hosta plants come to mind). The wildlife that azalea bushes do attract is the kind you probably want to see in your landscaping. Golden oriole will draw hummingbirds and butterflies. Mulch the plant for winter protection and, during the growing season, to help the soil retain moisture (plus for weed control). But when mulching for winter protection, avoid placing the mulch right up against the trunk: This could encourage voles. A number of other pests can plague azalea bushes, depending on where you live. One is the azalea leafminer, which commonly attacks Gibraltar azalea in May. You have to keep a close watch on your plants in order to detect this pest in time. If you do detect leafminers, either pick them off by hand or spray with an insecticide containing a pyrethroid or Neem oil. If you have had a dry summer and do not irrigate sufficiently, your azalea bushes can develop cankers. Prune off affected branches to arrest the spread of this fungal disease. If you feel the need to prune for aesthetic reasons (to restrict the size of your shrub, for example), it is best to prune azalea bushes right after they have finished blooming. Pruning too late in the year will rob you of flowers for next year. One does not usually think of yellow as a color for azalea bushes. In many areas of the northeastern United States, for example, pink, red, orange and white are among the most popular colors, but not yellow. But if you are ever on vacation in the Bar Harbor, Maine area in late May, visit the Asticou Gardens, where you will encounter plenty of yellow azaleas--for example, the Ghent hybrid named Rhododendron 'Narcissiflora'. Inspired by the color, you may decide to purchase a Golden Oriole azalea bush at a garden center when you return home. R. 'Narcissiflora' may have a superior fragrance, but this little birdie is a nice addition to a collection. You will like the fact that, with its orange buds and yellow flowers, it is bicolored (for all intents and purposes). In fact, while you may see pictures of other people's Golden Orioles displaying more intensely yellow flowers, yours may well retain a bit of that orange that suffuses the buds. This flowering bush is just an example of one type grown for its colorful spring flowers.